← Samsung Vibrant 4G In The Wild? Maybe Not. excellent. my CLIQ is has been having problems (accidentally dialing people, slow, dropping calls) so I am in the market for a new phone. I am only interested in tactile keyboard phones and I think the keys on the G2 are way too far apart. WiFi calling is so cool! I’m excited to pick this phone up tomorrow! NOOOOOOOOOO!!!! Don’t do it!!! Save yourself! what else should I get then? There aren’t any other phones I like. Wait to see what T-Mobile announces at MWC next month. You’ve waited this long! I’d wait. I will go check out the CLIQ 2 tomorrow or this weekend. I am limited in my selection because I NEED a keyboard. What is MWC? My friends and family are really infuriated with how sucky my phone is – I am MOST annoyed! Oh and Mobile World Congress is another electronics show. 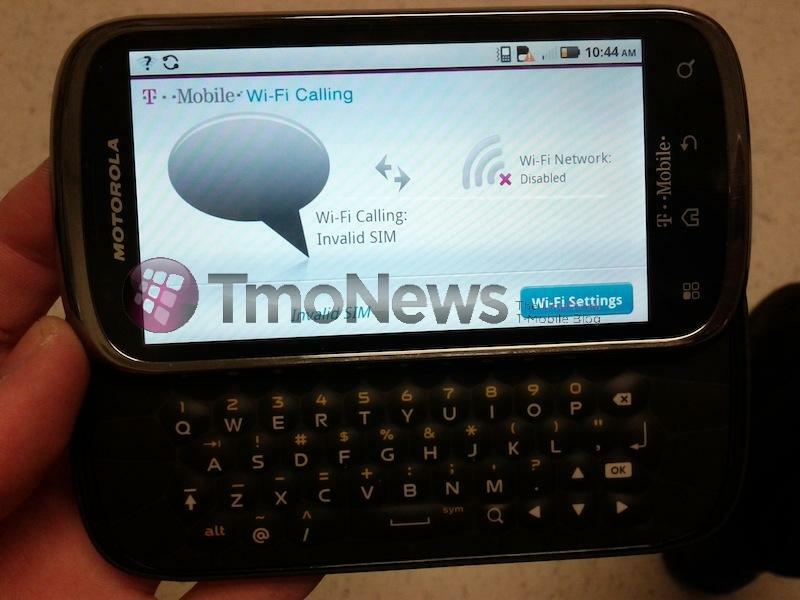 Hopefully Tmobiles upcoming devices will be announced. don’t know if I can wait. I’m going to see if I like the keyboard. I have the CLIQ 1 – is that ancient? It’s considered a high end budget phone?! Yeah that’s about a year and a half give or take. Right now its midranged. “Well I wouldn’t steer you from the cliq 2 especially considering its a high end “budget phone” ” –> I don’t get that. Are you saying the CLIQ1 or the CLIQ2 is a high end budget phone? Cliq 2 is high end budget. how do you figure $400 is “budget” – is it “budget” because it’s not $500?! Your right its more of a low high end phone. The name Cliq reaks of “Budget”. But yes a $399 phone is budget to me because I would hapily pay that rather than extending my contract. I paid $499 for my Vibrant contract free. ALSO keep in mind that a Motorola Droid X costs $569 last I checked so yeah $399 is wallet concious. Don’t listen to the haters. If you like your Cliq, get the cliq2. Period. thanks haha. I do like my CLIQ but I don’t like how in the contacts is EVERYONE on my facebook and twitter, and I don’t use all those stupid social networking widgets they have. but I like the other features on the phone and I like how it syncs people’s FB picture with their contact. Maybe it’s silly but I like seeing people’s picture when they call and I don’t have to do the work to set that up. My guess is people truly interested in the CLIQ2 and willing to be locked into a 2 year contract are owners of the original that had little to no interest in an update, or users who have never had a CLIQ. Either way, buyer beware. As an owner of the original CLIQ I will say that even though the physical phone itself is solid, the manufacturer support is non-existent. Based on Moto’s habit of quickly moving to their next best device or stringing consumers along and releasing updates late or never, just be sure that you can live with this phone if it never gets an update. isn’t your CLIQ running 2.1? Yea ive gone hands on with it..phone moves pretty quickly. motoblur all over it but the new version with the 1Ghz is nice. The keys I have to get used to them….soooo much different from the Cliq 1. I still worry about updates and things with the phone. this should be tagged as a “cliq 2” post! C’mon people phones like this are at the end of the road with with FroYo(or Gingerbread if its even bothered to be put on) and we should just look at it as such. You are hoop dreaming if you think any phone that comes out PRIOR to the release of Honeycomb for phones is gonna get 3.0(with the exception of Nexus owners) and if your “came with anything less than Gingerbread” phone even gets 3.0 then consider yourself lucky. More than likely XDA will hack Honeycomb onto a lot of phones (if possible) but the carriers damn sure aint gonna put forth that kind of energy. That said, I think the Cliq 2 will do pretty good and will be a huge improvement over the origional…But I still won’t buy one! I talked about WiFi calling? I’m talkin to the people who may want this phone to get updates for two years after they buy it. What am I missing that your missing? In case you didn’t hear, Honeycomb is for Tablets only!!! Lower your voice and google it. ANDROID outsells the iphone on t-mobile germany. Yes because android is on 50 different phones. If IOS was licensed/released to all phone makers like android is then it would be a whole different ball game. I’m not bashing android but they need to refine it more and not come out with a new OS every few months. but, you see, it does… the iOS platform consists of all ipods, ipod touchs, iphones, ipads, and tech. the nanos and shuffles too. But you dont hear anyone with android complaining about how many people that own those products (all the generations and different configurations in said generations). See people are stuck on the fact that there are numerous android phones… well yeah there are but almost “everyone” has had or has and ipod by now. Does that number not contributed to the total number of active IDevices…. of course it does. Apple is the only company that even able to use that OS! Think…Windows… which is what most people are probably using to access this site. It is actually licensed to manufacters which in turn use the OS and develop hardwire/optional software for the products. Its not androids fault that Apple doesnt deal with others outside of themselves. Maybe that’s what they call refining their OS more and more every year or so. I under stand with what you are saying, but the poster above me was only referring to phones, not all devices. There is also a difference with selling software/OS licenses to different company’s and keeping it locked/closed like Apple is doing. In fact I think Apple should do that but Steve jobs does not. I don’t have a problem with multiple phones running android and cell phone makers making the OS a little different. Android is putting out new OS’s to fast. This makes for updates slow for some phones and other things. I agree with you and all but Android is doing more of a fast paced evolution and instead of waiting a year, they just let it out to the public whenever a pivitol incrament has been reached. I personally can appreciate the fact that Google lets the OS out to the public often and eventually XDA gets to mod it onto our phones. This of course is not good for the Carriers and their regular subscribers who don’t wanna hack their phones though. BUT Google has already stated that Android will become more of an annually updated OS and with 3.0 I’m guessing that will be the new begining and the time frame your looking for. if the wifi calling app works as good as the one on the DEFY it rocks. as far as upgrades, buy a phone you will like for 2 years. i have 20 more months to like my DEFY. only thing i might get before then is a honeycomb tablet. then, i’ll like my DEFY for a lot longer. I am thankful that another Android Mobile is being released. Even if I am hesitant to even touch it. It has “Blur”. Doesn’t that mean; bloatware,batterykiller,bogged-with-crap-apps? 4 rows of keys, even though there looks like plenty of space for 5 rows of keys in all that empty keyboard space. since this post is about the wifi calling feature I figured I’d chime in with something. When they first announced this for Android I was ecstatic. I’m abroad up to 5 months out of the year and thought this feature would be beyond amazing as a lot of hotels, etc have free wifi. The only thing that you are charged are minutes when you are using WiFi calling overseas. If you have unlimited minutes, then you have unlimited airtime overseas. HOWEVER…a “local” call overseas (so if you are in London and call someone else in London who has an EU phone number) you will be charged toll charges. If you call from London back to the US, it is considered a local call….no toll chargse as the device over WiFi is like calling from the US.